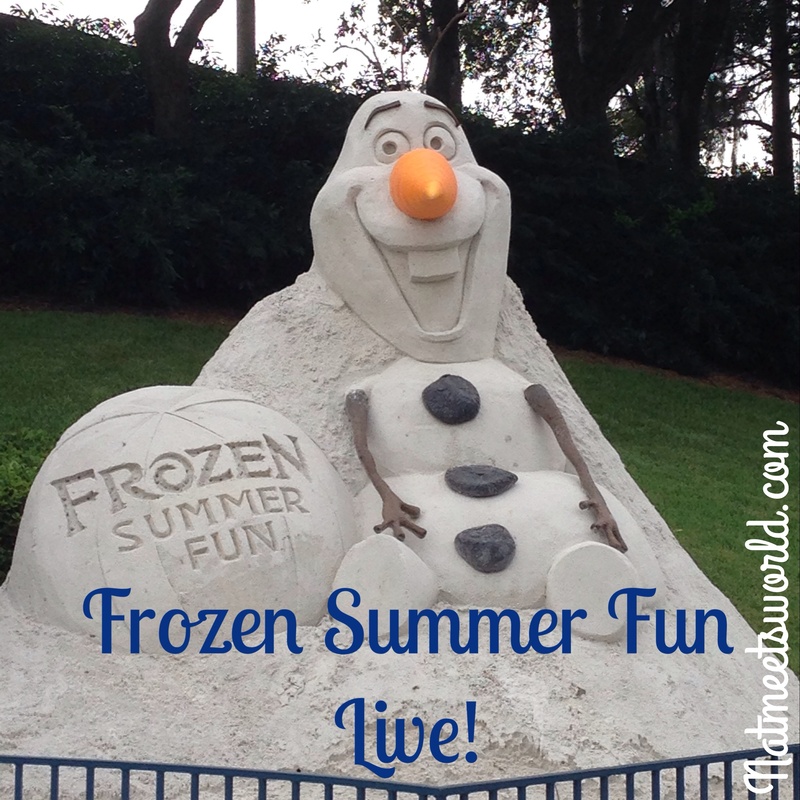 Frozen Summer Fun Live at Disney’s Hollywood Studios Is A Must Do This Summer! As we all already know, Frozen has completely taken over not only the Disney parks, but shops and even our living rooms with merchandise, the movie itself, and my personal favorite, singing all of the iconic songs! 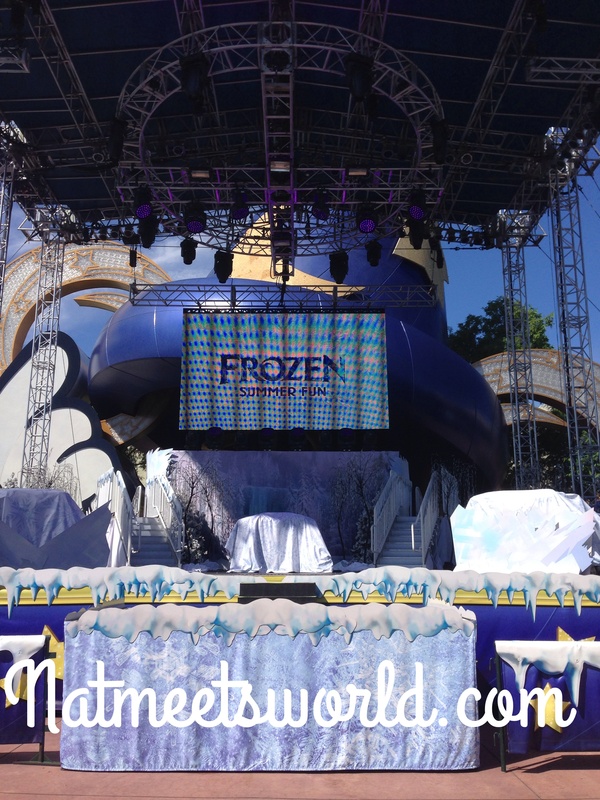 This past week I was able to experience the Frozen Summer Fun event at Disney’s Hollywood Studios! This is an event that you’re not going to want to miss if you or your little love bugs have Frozen fever. It is jam packed with events and Frozen themed fun that is unique and one of a kind! The best part about this event is that due to it’s popular demand, it has been extended until September 28th for more summer Frozen fun! Do you think Olaf will approve of more summer fun? I think so…. From the moment you walk into the park the presence of Frozen is wrapped all around you. From the signs and unbelievable Olaf sand sculpture, to the magical touches of icy themed stages and shows, there is no denying that Hollywood Studios did a fantastic job of presenting the film and characters with the most attention to detail. There are so many great events and it may be challenging to try to do them all on a tight schedule (or all in one day), but don’t freeze up on me now (pun intended), I am here to help you out with that! Below are all ( yes, I said all )of the Frozen events that Hollywood Studios offers during the Frozen Summer Fun Live event in the order of which I would visit each experience. If you plan to visit, this is the best way to make sure you get every Frozen experience completed. Let’s check it out! 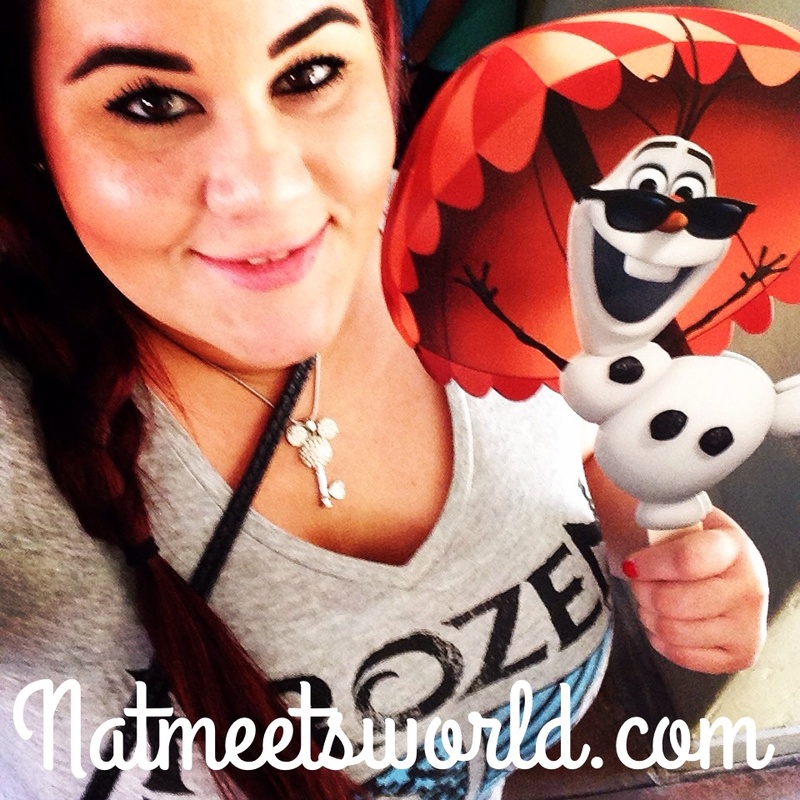 Check out my pic for #olafsummervacation ! Olaf on Summer Vacation: Throughout the day, Olaf will make appearances at the main stage by the Sorcerer’s Hat to give guests updates on his own summer vacation adventures. As soon as you enter the park in the morning, be sure to grab an Olaf fan to use throughout the day (trust me when I tell you, you haven’t experienced a hot day like one in the parks in the summer. You will be using these fans all day). If you don’t get one at the main entrance, there are other stations around the park that do have them, but take it from me, you will want to grab one early to use throughout the day, plus, it’s a great little ‘souvenir’ of your experience. Once you grab it, make sure to hashtag your pictures (#olafsummervacation) as you post them on social media throughout the day. It may be used at the end of the day ceremony! If you want to see these updates throughout the day, head over to the Sorcerer’s Hat when you have downtime. Now that you have your Olaf fan, head over to Hollywood Boulevard for Anna and Elsa’s Royal Welcome. This is the main stage in front of the Sorcerer’s Hat where most of the entertainment is held. Anna and Elsa’s Royal Welcome: Grab a seat on Hollywood Boulevard (the main street upon entering Hollywood Studios) to welcome Anna and Elsa, who are accompanied with Kristoff and the people of Arendelle as they make their way toward the stage located at the iconic Sorcerer Hat to welcome Frozen into the park. This is such a great way to start the day, and I highly recommend staying to watch it no matter how hot it gets, or how small the line is at an attraction. If you came to the park for Frozen, this is a must do. This is also great if you haven’t had the opportunity to meet Anna and Elsa in person (due to the long lines and FastPasses being sold out quickly) because you will get to see them pretty close up. 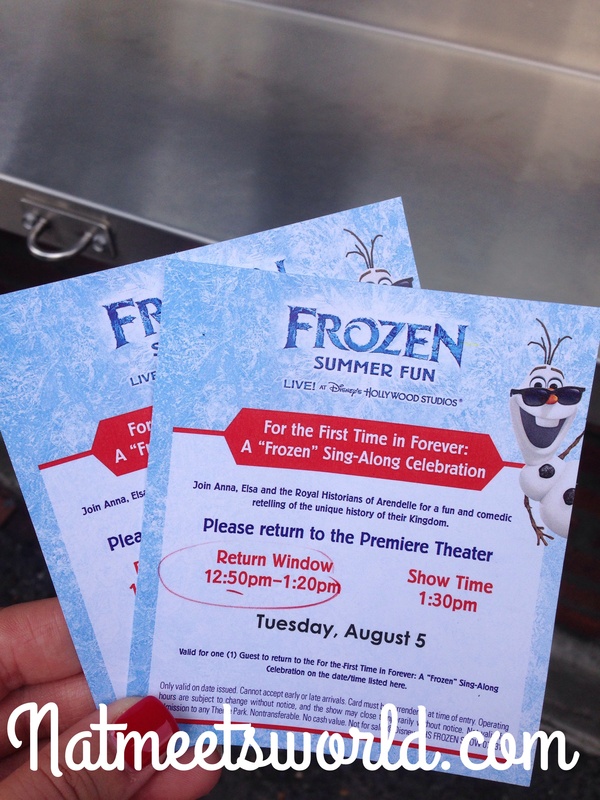 Tickets to the Frozen Sing-Along show. For The First Time In Forever: A Frozen Sing-Along Celebration: Head on over to the back corner of the park (check your park map for exact location) to grab your ticket for the Frozen sing-along celebration. This is DEFINITELY a must see. My honey was skeptical about seeing this show because it is a sing-along and he knew I would be belting out the Frozen songs, but when it was over, he had a smile from ear to ear and absolutely LOVED it. There are several shows throughout the day that you can choose to attend. When you arrive, wait in line and a cast member will ask you what time you would like to experience the show and they will give you the exact amount of tickets for your party to attend. If you do not have a ticket, you will not be able to watch the show, so make sure you grab some. Try not to go to the first show since it gets really overwhelming and tickets run out quickly. We were able to get tickets to the second show without a problem. The great thing about this system is that once the tickets run out, there isn’t anymore room which means that you are guaranteed a seat. Don’t be fooled though, make sure to arrive at least 30 minutes prior to showtime so that you aren’t sitting in the very back of the theater. If you follow this schedule, grab a ticket and explore the park until your showtime. I won’t spoil everything for you, but here is a sneak peak from the show (below). Oaken’s Frozen Funland: This Frozen Funland includes ice skating and give the little love bugs an opportunity to build a snowman. Ice skating is $10 for a 30 minute session. It also includes Oaken and his cousins and how they have created winter magic all summer. The line does get very long, and even if the kids don’t skate, it is really worth going to just for the view. Wandering Oaken’s Trading Post: While you’re checking out Oaken’s Frozen Funland, you can explore the food and beverage and merchandise options at the Wandering Oaken’s Trading Post which is in the same location! Coolest Summer Ever Dance Party: Head on over to the main stage in front of the Sorcerer’s Hat at 5:30 PM for a spectacular dance party with a DJ and a live band! 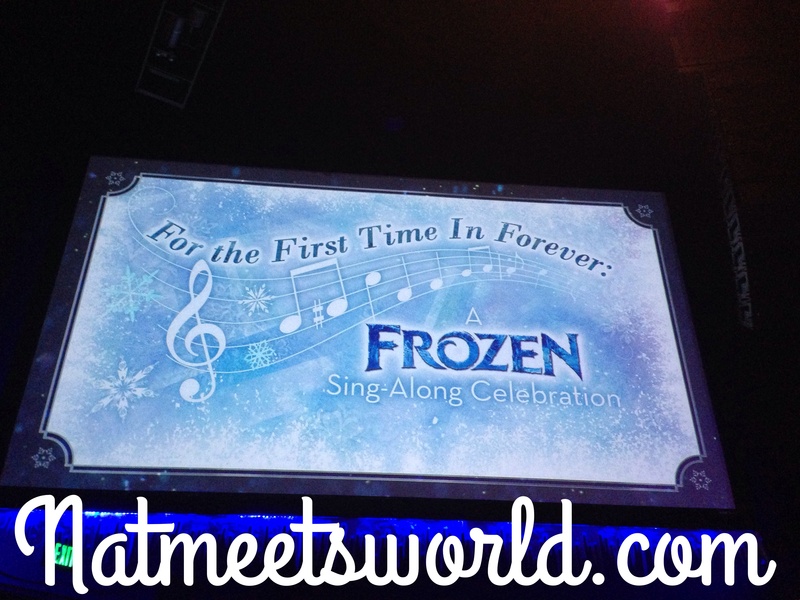 I had such a great time dancing around to a medley of Frozen songs! Not many adults were busting a move, but I just couldn’t help it. I had to join in on the fun (while my honey enjoyed a cream cheese pretzel and shook his head and chuckled as he saw me ‘releasing energy’). The little love bugs (and myself, obviously) really enjoyed this. 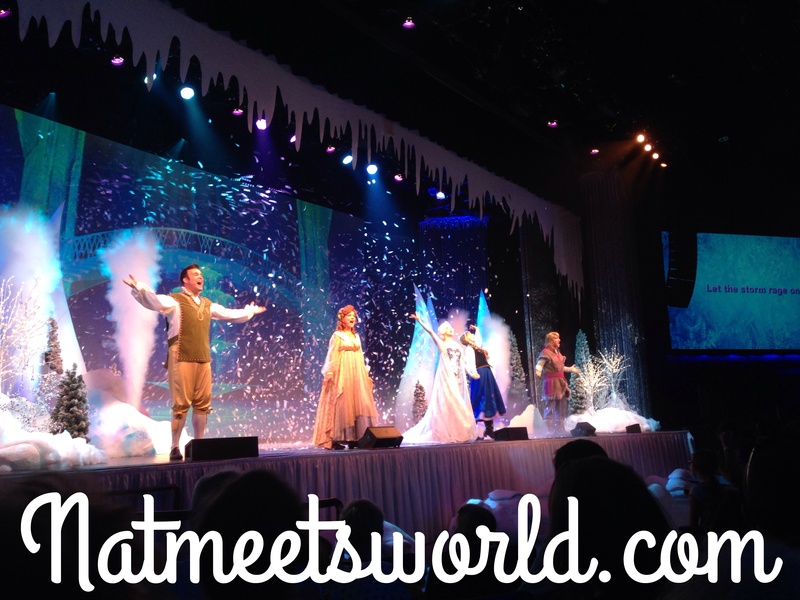 Frozen Summer Fun Premium Package: If you are a huge Frozen fan, you may want to look into the Frozen Summer Fun Package. At $69 per adult and $39 per child, you can enjoy designated viewing areas and refreshments for Anna and Elsa’s Royal Welcome, any show time of your choice for the Frozen Sing-Along, and designated viewing areas and dessert paired with alcoholic and non-alcoholic drinks for the Frozen fireworks show. You can purchase this package by calling Disney reservations (must be 18 or over to call). 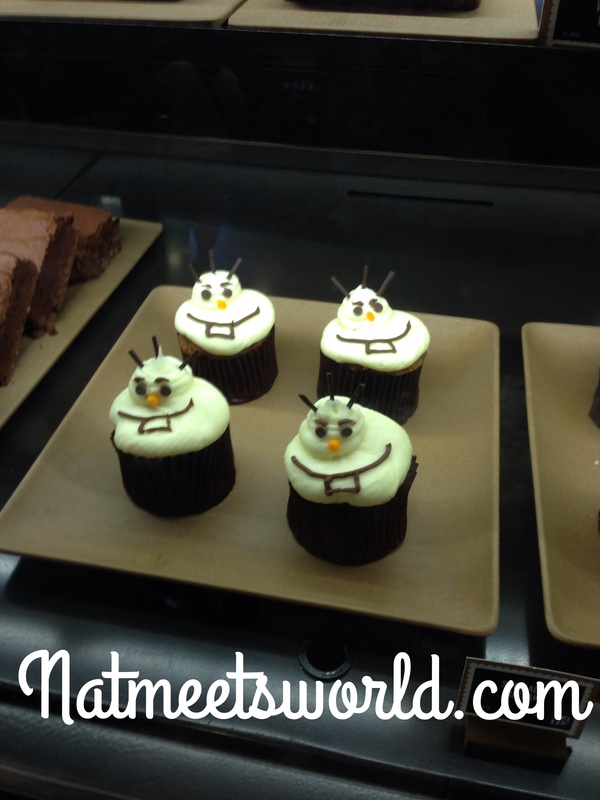 I Love these Olaf Cupcakes! Throughout the day, checkout the various places you can check out for Frozen themed merchandise, sweet treats, and picture opportunities. The backgrounds for the picture op’s are absolutely beautiful. Check out one of the backgrounds my honey and I were able to take a picture at (below). We were standing all the way to the left because Sven was entered in the picture when I looked them up on my Disney Photo Pass. 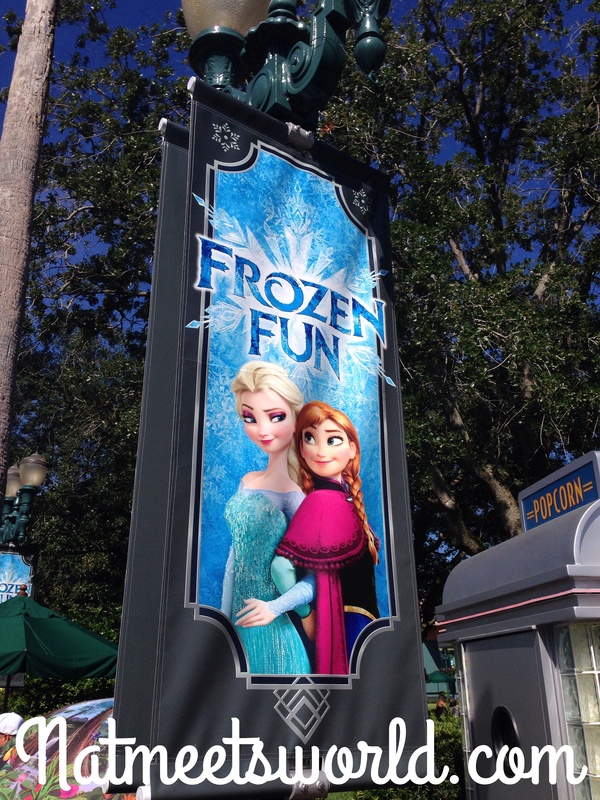 Were you able to visit the Frozen Summer Fun event? Let me know what you thought below! If you have any more questions about the event, comment below! Disclosure: All images and opinions are my own. Dates, times, and pricing are all from the Disney website.